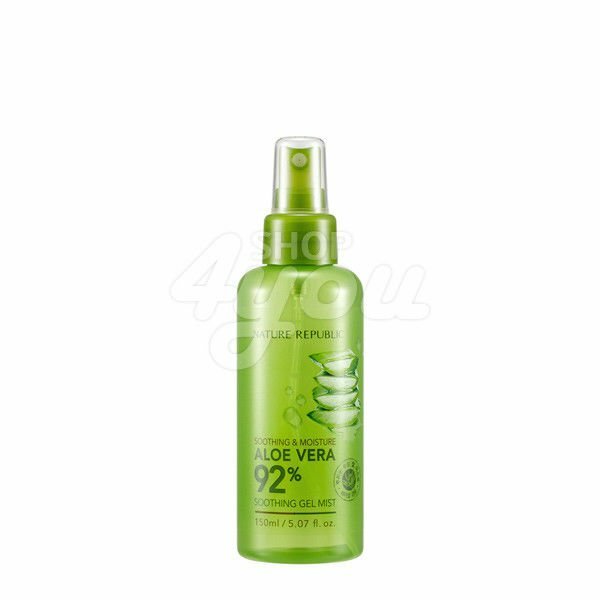 Nature Republic Soothing & Moisture Aloe Vera 92% Soothing Gel Mist 150ml■ DescriptionThis soothing gel mist is a gel mist that moisturizes and protects the skin against the harmful environment.It can be used on face, arms and legs. ■ How To UseSpray frequently to moisturize dry skin or to protect the skin from the harmful environment.When using on the face, apply 10 ~ 15 cm away. ■ Volume 150ml ■ Notes on useIf you use cosmetics in the following over, the same shall stop using, please consult a dermatologist if symptoms are worsening because continued use.If there are abnormalities such as redness, swelling, itching, and irritation while using.If there is more than the above by the site of application in direct sunlight.Do not use in areas with abnormalities such as wounds, eczema and dermatitis.Storage and Handling Precautions.Make sure that you always close the cap after use.Keep out of the reach of infants and children, and consult a doctor immediately if swallowed.Do not store in hot or cold places and direct sunlight.Close the cap will be stored in a cool place does not shine daylight after use. ■ PaymentPayment we accept Paypal Only. ■ Feedback PolicyAutomatically leave the positive feedback when you paid for item. ■ Refund & Exchange60 Days - 100% Satisfaction Guarantee!But if you're not happy with your purchase, you can return and get exchange or refund.For return, items must not be worn & include the original undamaged packaging.Except our mistakes, return shipping will be paid by you. ■ Contact UsWe are willing to respond to your inquiry.If you have any question, please feel free to contact us.I'll try my best to answer them as quickly as possible normally within 48hrs. ■ Shipping PolicyWe ship to Worldwide.Shipping location is from South Korea.Usually ships within 3 days after payment is received.Combined shipping : If buyer make payment for items at a similar time we will ship all items together in one box.If buyer want insurance for package, buyer have to pay extra USD $ 2.80 for insurance.Average shipping period is:Asia (Japan, Hongkong, Singapore, Thailand etc. ): 7 ~ 14 working days.Oceania (Australia, New Zealand etc. ): 10 ~ 35 working days.North America (USA, Canada etc. ): 10 ~ 35 working days.Western Europe: 7 ~ 18 working days.Middle East (Saudi Arabia, India, etc. ): 14 ~ 42 working days.Eastern Europe: 15 ~ 21 working days.South America and Africa: 21 ~ 30 working days.This period is for Economy & Standard shipping. This average time can be changed depending on each country's custom. Economy shipping - No tracking number Standard shipping - With Tracking number Expedited shipping - With Tracking number, 4 ~ 10 days to your door. ■ Customs TaxImport duties, taxes and charges are not included in the item price or shipping cost. These charges are buyer's responsibility. Please check with your country's customs office to determine what these additional costs will be prior to looking or buying.